Watercolor and Ink on Canvasboard, 10" x 10"
We've been away from home, visiting family in Pittsburgh and the mid-west. The next few days’ paintings, therefore, are part of my beach-inspired work. This piece, Lighthouses, Water, and Sky was inspired by the trip we took with Arny's sister and brother-in-law to a place that Arny and Elaine had visited when they were kids. It's the Door Peninsula, which sits between Lake Michigan and Green Bay (yes, the one that the football team is named after). I loved the idea of visiting a place that Arny had such fond memories of. Then we went there, and I found I loved it myself. We stayed at a charming bed and breakfast, called The Garden Gate, in Sturgeon Bay, and each day, we'd go out to hike and explore what the county had to offer. People who don't live near the Great Lakes would be surprised how much shipping travels through the lakes and how wild the water can get in bad weather -- particularly in the winter. Thus, the shorelines of the Great Lakes -- including the ones of this lovely peninsula -- are dotted with many interesting lighthouses. 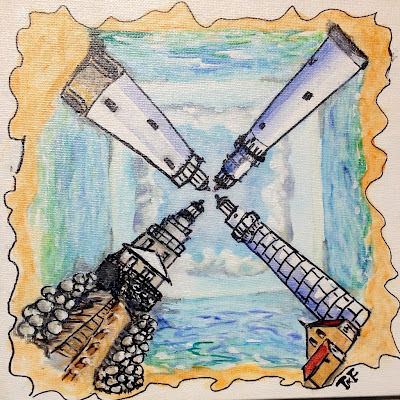 As part of my effort to move toward abstraction, I used four area lighthouses as design elements. Between them, I celebrated the beautiful green and blue waters that typified of that area. I love seeing the range of greens, turquoises, and blues of the water for itself, partially because as a young person, I assumed that only the sea around tropical islands could be so beautifully hued.